Voice search has come on strong in the past year or so. Bing Ads has been ahead of the pack on voice search, predicting a year ago that it would be big. Purna Virji of Bing Ads talked a lot about voice search in her recent Reddit AMA, as well. I’ve definitely noticed more obvious voice queries in our clients’ search query reports lately. The much-ballyhooed “near me” searches are showing up in droves in several client accounts. We’re also seeing really long search queries, with 15-20 words not uncommon. Queries that start with “give me the number for” or “can I get the name of” or “what’s the company on First and Main” are prevalent, as well. As search marketers, though, voice search is wreaking a bit of havoc. The search engines, despite their outward support of voice search, seem to have trouble handling lengthy voice queries. Our clients’ ads have shown on some highly irrelevant queries that are obviously voice searches. 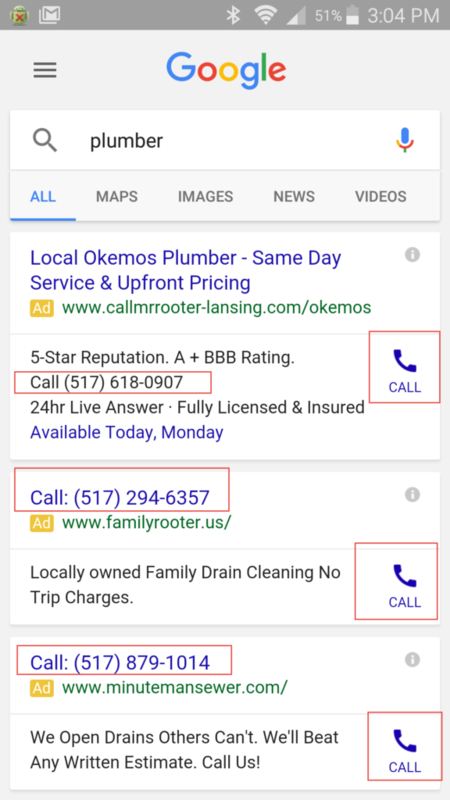 But when call-only ads show on irrelevant voice searches, they tend to generate unqualified phone calls – wasting client call center resources on top of wasted click costs. Another issue is that the engine’s negative keyword functionality hasn’t kept up with voice search. Negative keywords don’t work when the negative term appears more than 10 words into a search query. So if you have “free” as a negative keyword, and someone voice-searches “what’s the name of the company on fifth and main that offers free haircuts to kids,” your ad will still show – even if you’re not offering free haircuts. This is becoming a bigger and bigger problem for our clients. Another huge issue is close variants. Close variants have always been a problem, but with voice search, we’re seeing even bigger challenges. The problem is, with voice search, the two are very different. Let’s look at an example. The first query is clearly someone who is looking for a specific business. They just can’t remember its name. If you’re that business, you’re in luck. If you’re not, you’re going to get a lot of clicks and/or phone calls from people looking for a competitor! Not cool. The second query is clearly from a user who is looking for a business phone company. If you’re that advertiser, this is exactly the prospect you want. It’s an obvious lead-generation question that should convert well. And yet, if you’re bidding on “business phone companies,” your ad will serve for both queries, because of close variants. I’ve become increasingly frustrated with this as time goes on. There’s no way to keep your ad from showing on irrelevant searches, and the irrelevant searches are becoming more frequent due to voice search – leading to worsening ROI from paid search. We can only hope that the engines will reconsider their stand on close variants and give us the option to choose to include them once again. Otherwise, I can envision paid search quickly becoming too expensive with too low an ROI for many advertisers. What do you think? Is voice search helping your PPC performance, or hurting it? Share in the comments! I don’t even know how to figure out whether a certain search came via voice or keyboard. After reading this article, I’m not about to find out – ignorance is bliss, after all! Haha! I’m guessing – I don’t really know. Certain queries that are long and sound like natural speech, I’m assuming are voice. That would be a cool indicator for the engines to include in SQR data, although I don’t expect they’ll share that with us. Fantastic insight into query intent. I’ve seen a lot more queries like you described in the past year. I’ve even begun omitting ‘ok’ from my US state negatives because of ‘ok google’.I rarely use voice search, myself, but I think it’s great. it makes searching easier, available to more users and more situations. With new opportunities come new challenges. You’re right – new challenges for sure! The number of obvious voice queries has skyrocketed over the last 3-4 months, at least in our accounts. We’ll need to adjust and adapt. Your call-only pet peeve seems to have incorporated a voice search appendage. Truly terrifying! I know! And the scary part is, I didn’t even think about that aspect until I started drafting this post. Very eye=opening. With your call only campaigns are you using any kind of automatic optimization? I ask because I wonder if Google Adwords can possibly parse out the user intent via it’s machine learning when optimization is on. I can’t say this is a big issue for our clients just yet but I have noticed an uptick over the past 3 months in longer search quires with the “near me”. For our local clients this has been an overall big win. For the national clients it is a slow bleed on the campaigns currently but no where close to a big issue for us just yet…. We’re using bid automation on call only campaigns, but that’s it. I wouldn’t think bid optimizations would affect what queries the ads are shown on. Agree that “near me” is a huge win for local and a growing problem for national clients without a local presence. Definitely something to watch. I agree and have seen alot more “near me” “nearby” “close to me” queries over the last several months. I’ve actually felt that NOT having Call Only Ads and using Ad extensions instead has improved the quality of the calls & reduced the number of unqualified calls by offering another option of clicking to the site or clicking the “call” button. This is more of a “feel” and feedback from clients than hard data on the quality of the calls. Man, the typed queries are bad enough without adding spoken ones. I will have to check for this in my client accounts. Not having a choice for excluding “close variants” is yet another mistake Google made in taking away our control. Like having a bid modifier for tablet devices I don’t just put up with it. I have been complaining for months every chance I get. But if we start seeing stupid spoken queries that are not on target we all need to complain about that. Frankly, Google has NEVER invested anything that I have seen in user-training. How many of your clients or family know about and use quotes when searching? How about “-[word]” option? I think it’s great that Google can have a product that does a good job figuring out what people mean. But how much less of a struggle would that have been, and how much better would searching be if they just had users do a little more work to indicate what they want? © Copyright 2017 Beyond The Paid, LLC. All rights reserved. Opinions expressed here are mine alone, and do not necessarily reflect the views of my employer.